With a month's supply of leave-in scalp treatment, the 30 day programme utilises advanced stem cell science to help maintain hair density. The non-greasy formula expertly adds body and texture to hair and helps maintain density for fuller, healthier looking locks. Its combination of Stemoxydine and Vitamins B3, B5 and B6 inspire thicker, texturised hair with visibly improved body. Suitable for sensitive scalps and thinning hair. *Each pack contains 30 applications, enough for 1 month. 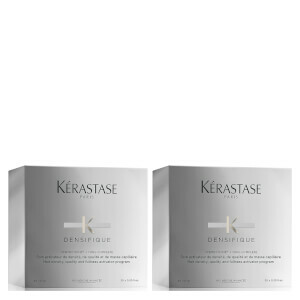 Kérastase recommend using Densifique for a total of 3 months. 1. Open the bottle and clip on the applicator. 2. Press the applicator to dispense the treatment over your scalp. 3. Make partings in your hair and apply according to the usual styling direction. 4. Massage your scalp with your fingertips to distribute the treatment and encourage penetration.